An exhaustive report by engineers at the National Institute of Standards and Technology (NIST) has identified blockchain technology as vital to the security of smart manufacturing. The emergence of smart manufacturing, a part of Industry 4.0, is allowing manufacturers to be increasingly reactive and efficient. However, it is not without its problems. Because it involves digitally transmitting manufacturing data, such as blueprints, between multiple parties there is the risk of data theft, tampering and corruption within the process. For example, a hacker could gain access to a manufacturing system, intercept such data and alter it before sending it on, resulting in incorrect or even damaging products being manufactured instead of the intended results. The solution, according to NIST’s report, is blockchain. The technology that underpins cryptocurrencies, blockchain involves a chain of records, the contents of which are globally agreed upon. This means once a record set, or block, is committed to the list, or chain, it cannot then be changed. This makes the technology highly suitable for smart manufacturing, as it would allow digitised manufacturing instructions to be safely transmitted between stages without risk of tampering. 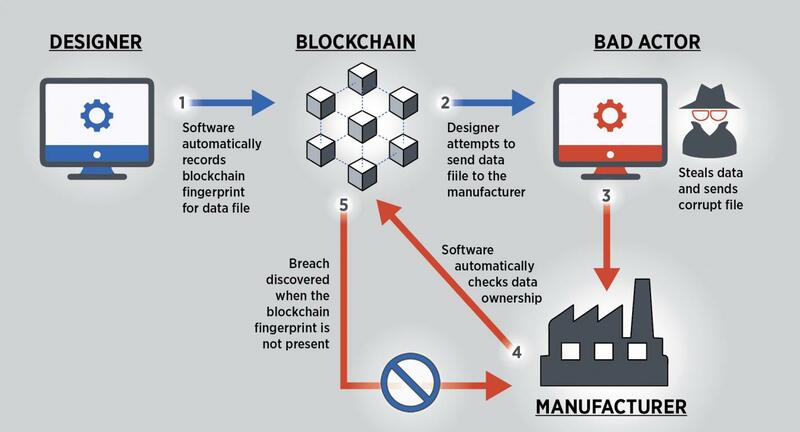 “In other words, if I’m a manufacturer making a part for a product and I receive the specs for that part from the designer who’s upstream in the process, blockchain ensures that I can trust the data actually came from that person, is exactly what he or she sent, and was not interfered with during transmission,” explained report lead author and NIST research associate Sylvere Krima. This would prevent cyberattacks on the manufacturing process, because records that had been interfered with would be instantly recognisable as such. “For instance, we give the example of product data being sent by a designer to one manufacturer who then must transmit updated data to a second manufacturer for further product processing,” said report co-author and NIST mechanical engineer Thomas Hedberg. In order for blockchain to be implemented in smart manufacturing, it needs to be integrated into smart networks, so that it cannot be overridden or ignored. NIST has taken the first steps to making this a reality, by detailing the statements and codes in a standardised system for computer modelling, Unified Modeling Language, that are required. ”Following our reference information model will enable users to authenticate everything within their blocks: where are the data coming from and going to, who is executing the data exchanges, when are the exchanges taking place, what is being exchanged, and how are the exchanges being conducted,” said Krima. “The goal of this reference model is to secure the digital thread for smart manufacturing while enhancing collaboration and establishing trust between production partners,” added Hedberg.